As promised, here is the how-to for the chevron clutch from yesterday's outfit post! I've been a little bit obsessed with chevron lately, even more than houndstooth--and that's saying something! That's why when I spotted some super-cute glittery chevron clutches a couple of weeks back and I immediately knew I was going to have to make my own. My first stop was Goodwill to search for a suitable clutch. I new it needed to have decent-sized flat sides to have room for several chevron stripes. Lucky for me, I found a perfect specimen right away! Glitter - For my first attempt, I decided to go with a muted black glitter. You can get creative and mix glitters for added depth if you'd like. Mod Podge Gloss - This is your adhesive. Small bowl lined with foil - To mix the glitter and Mod Podge. Paint brush - Get ready to get in touch with your artistic side. 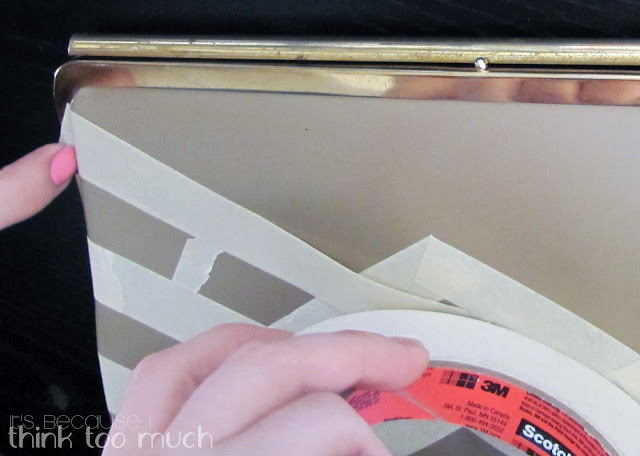 Masking tape - You could probably use painters tape as well. Scissors - You will need this to make straight edges with the tape. Measuring tape - This will come in handy to make sure your zigs and zags are evenly spaced. To get started, grab your measuring tape to assess the width then divide by five. Take your masking tape and start taping at a slight diagonal across your first section. Use your scissors to cut the tape. Start taping again lining up the corners and taping up the opposite diagonal. As you go along, try to keep the the peaks and valleys of your diagonals at an even height. Keep taping until you've completed all five diagonals. To guide you as you tape the next line, use a small piece of tape lined up against your first line. Then place your next strip of tape right up against the guide to keep the spacing even. Keep taping until you've finished the first side. Then continue the zig zag pattern along the bottom and tape up the entire back side. When you're done with the second side, tape up any hardware you won't want to get glitter on. In my case, that is all of the metal edging. Now it's time to get sparkly! Line your work surface with something you won't mind getting glitter stuck to. I chose pages from a catalog I was done with. 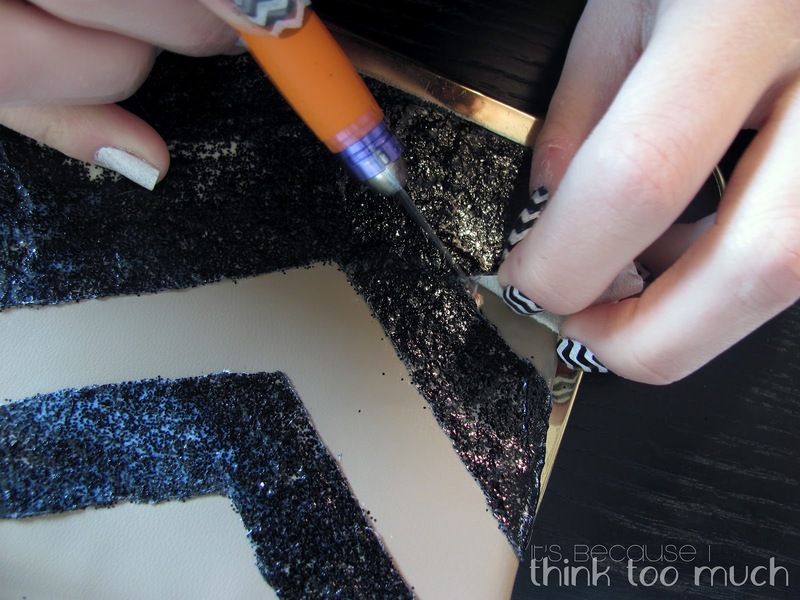 Poor your glitter into your foil-lined bowl then poor some Mod Podge on top. Use your paint brush to mix the two together. 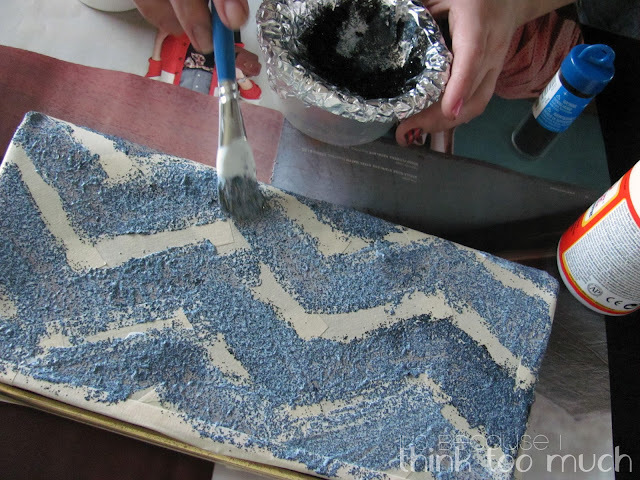 Then start to paint the tape-less sections of your clutch. It's best if you do think layers and let them dry in between applications. If you're impatient, like me, use a cool hair drier to speed up the process. Keep painting until the glitter is to your preferred consistency. When you're done, let it dry overnight. Then comes the part I wasn't expecting. 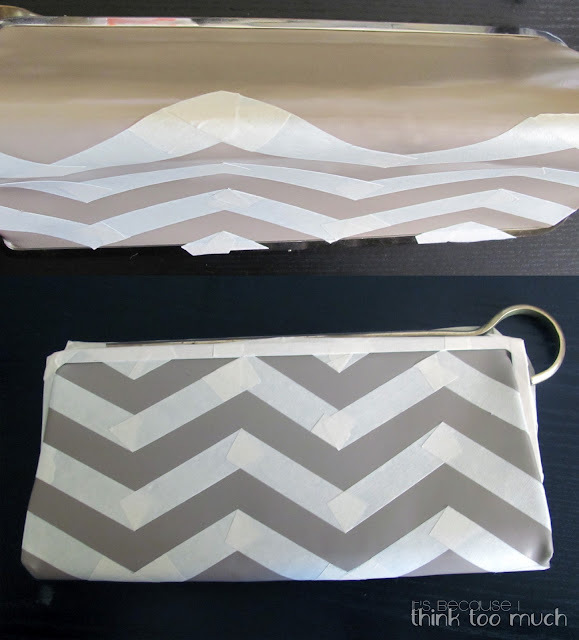 I thought I would just peel off the tape and be left with chevron stripes. however, I was a little off in my guess. As I carefully peeled off the tape guidelines, I used a craft knife to seperate the tape from the glitter to be left on the clutch. 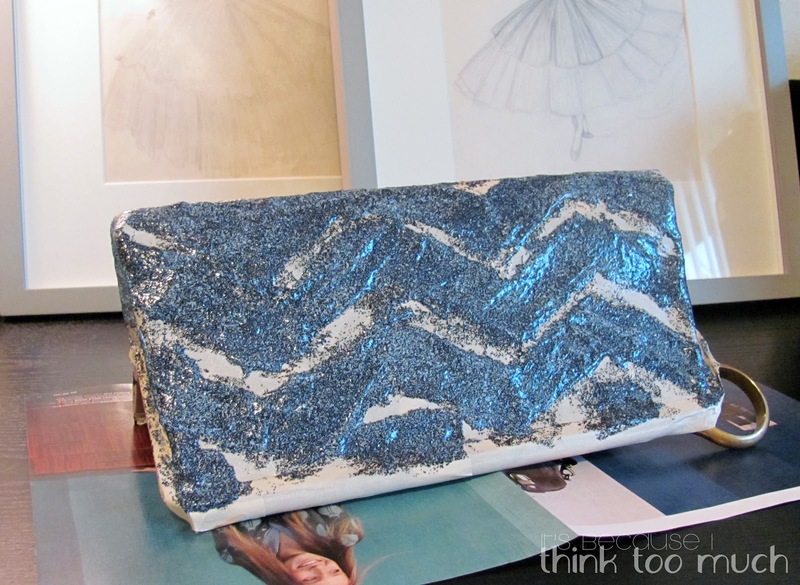 Before you know it, you'll have a lovely chevron glitter clutch! Now that I've done one round and got the hang of it, I want to make another! 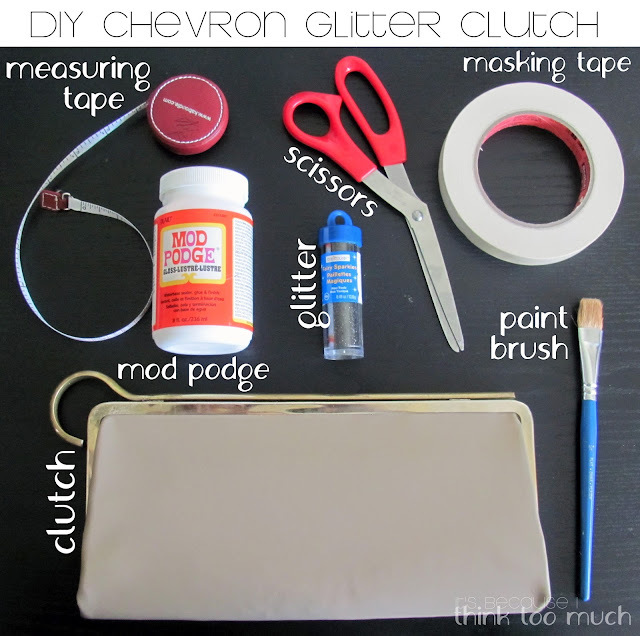 I'm already on the hunt for another viable clutch to pair with another color of glitter. I may also play around with the width of the stripes as well. It's going to be so much fun! And as always, if you make your own, I would absolutely love to see how your variation turns out! Send a photo my way and you may just get featured here or on the IBITTM Facebook page! Always so savvy! Love this, and I still have a hankering for your heart DIY! awesome! Also love that your nails are also chevron, lol. Self-done or are they nail wraps? I hope you do this heart DIY! It's so easy!